Stems rather stout, rough, reddish, angled, 1 to 3 feet high from a thick, long, perennial rootstock. Basal leaves forming large patches, three to four to each stem, broad, cordate, with a large, irregular sinus at the base, rough above, harsh, thick, the marginal teeth with curved sides; petioles long and slender, upper leaves oblong with short, broadly winged petioles, the uppermost sessile and pointed. Inflorescence hairy and glandular, broadly corymbose and more or less irregular; heads of flowers each about one-half of an inch high; peduncles rigid, thickish; ray flowers about sixteen, each about one-half of an inch long, chiefly lavender colored, sometimes violet or paler blue; bracts conspicuously green-tipped, the lower ones pointed, the inner ones oblong and blunt; disk flowers turning reddish brown with age. In moist or dry, shaded places, Quebec to Minnesota, south to North Carolina. Flowering in August and September. 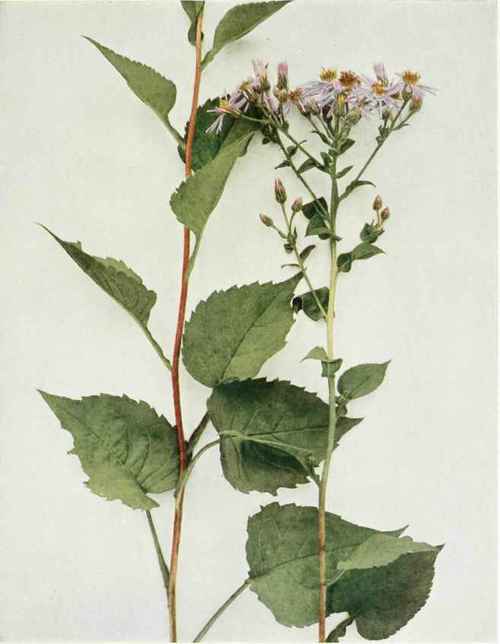 Consists of numerous races, many of them described as species, differing in leaf character, pubescence, shape of inflorescence and other characteristics.